A former player came to the office this afternoon; and knowing as he did that I went on a whirlwind trip to Bacolod the other day, his natural question was if I saw the dancing flight attendants. I told him I flew with PAL. There was, the other day, a Youtube link shared on Facebook about Cebu Pacific flight attendants dancing prior to a flight. Another Cebu Pacific marketing ploy, I thought to myself; and paid the matter no more attention. 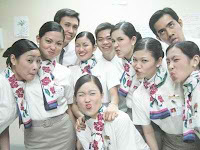 Just now, on TV Patrol, I was surprised to hear that the dancing flight attendants have already stirred quite a fuss. 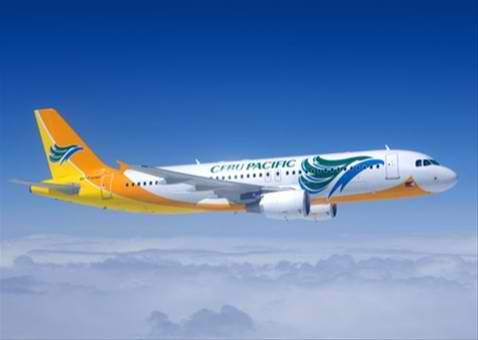 Apparently – or at least that was how Cebu Pacific spokespersons explained it – the dancing was aimed at catching passengers’ attention while the pre-flight instructions to passengers are given. The first time I flew with the airline, I was so hungry that I made the mistake of asking for a sandwich. The stewardess had the brightest smile as she handed me my sandwich; but of course she asked me to pay an arm and a leg for it! How was I to know that airline did not serve peanuts and biscuits as PAL did? I was flying with them for the first time! As though making an effort to make me feel better for shamelessly overcharging me, midway through the flight one of the attendants stood in front and, speaking through the microphone, announced that we were all going to play a game. He would be giving away a visor cap and a tumbler to the first persons who could bring him a belt buckle! And of course, there were those who hastily took off their belts and practically climbed all over each other to hand over their buckles – as though the cap was worth a fortune! In today’s news clip, TV Patrol showed an interview today with a Cebu Pacific passenger who complained that the dancing routine was corny. What was he complaining about? Cebu Pacific has always been cheap and corny! That is their selling point! For the record, a foreigner thought the whole dancing to-do was brilliant! 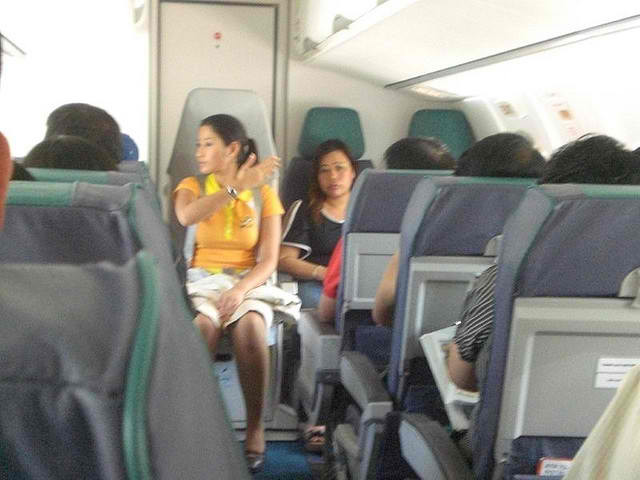 Flight attendants of other airlines, the report went on, were starting to complain that they were nababastos… The clip even showed one flight steward saying that a passenger had whispered to one of his female colleagues, “Sasayaw ka ba?” Eh ano naman ang bastos sa tanong na ‘yun, unless there was an overt sexual innuendo that accompanied it? That, the report did not say so. Perhaps the passenger was just being curious if this airline would get onto the dancing bandwagon as well! It would have been a perfectly natural assumption. A flight attendants’ association has already started to determine if the ploy exploits women’s rights. Any accusations will now be hollow because some of Cebu Pacific’s stewards have started to dance in flights as well. The airline was quick to point out that none of their attendants are being forced to dance. There is a bit if skepticism to this; but I, for one, can believe this! 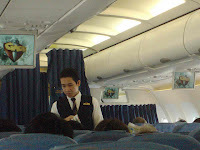 I love flying PAL; but Cebu Pacific attendants always seem to have this much more cariño for their carrier than PAL attendants do. They are always bubbly where PAL attendants can be almost – uhm – tight-assed! Take my flight yesterday back to Manila from Bacolod. The recorded instruction played over the public address system before take-off said passengers should turn their cell phones off as long as the fasten seatbelt signs were up; and that they could turn these back on as soon as the signs went off. Mid-flight – when the signs were off – I tried to relieve the monotony by trying to finish yesterday’s blog entry. In no time at all, a stewardess was at my side asking me – admittedly in a polite if stern manner – to please switch my phone off. Rather than attract the attention of other passengers, I told her I would just finish my sentence then switch my phone off. By the way, two passengers across me in the flight to Bacolod had their phones on for the duration of the flight. Also, I had booted my phone on to not search for a signal – you can do that with my Nokia – but what was the point in being argumentative when there was just a quarter of an hour left of the flight? To get back to the dancing, personally, I think it is a brilliant idea! I do not buy the airline’s explanation that by catching passengers’ attention, the attendants will hopefully communicate the pre-flight instructions better to the passengers. The truth is, if you have flown a few times, you just do not pay attention to the instructions anymore. My fear is that – if anything – new passengers will be distracted by the dancing even more away from the seriousness of the instructions being given. But as a marketing ploy – sa tunay lang – don’t the other airlines’ marketing people just wish they thought of this themselves? How many people will be scrambling for Cebu Pacific tickets if just to see with their eyes what they have already seen on Youtube?